Written by Bill Marvel and originally published in the SoCAL-RVlist. Two days ago I got around to doing something that I had planned last year—actual pull tests on riveted aluminum coupons to see how critical it is to drive rivets to the correct height. All of us building or with completed airplanes (as will those planning on it in the future) have had to wonder which imperfect rivets to drill out and which are OK. The answer is obvious when there is a severe cosmetic problem, but when strength is at issue, how much does a slightly under or over-driven rivet affect strength? How much does a grossly under or over-driven rivet affect it? Frankly, I had made the decision that the risk of damage from drilling out a flush rivet is greater than the benefit of doing so, unless an obvious cosmetic defect or really bad rivet is at issue. Now I have some hard data to go by. What I did was to make up 10 test coupons. Each of these consisted of two pieces of .032 2024-T3 sheet 1.5 inches wide and 4 inches long. 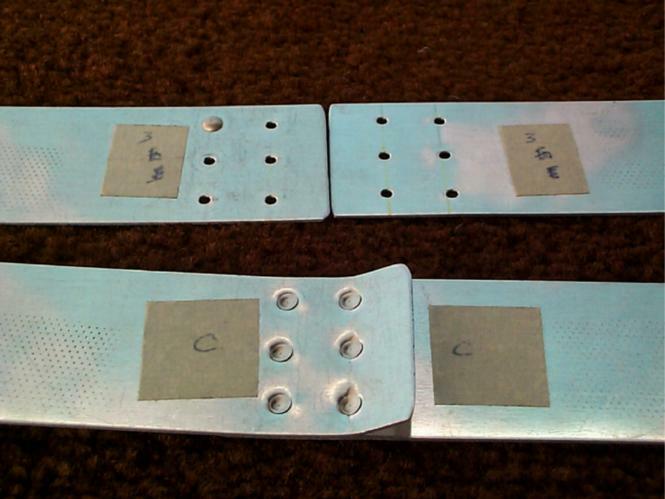 These two pieces were overlapped by 1.5 inches and riveted together with two parallel rows of 3 rivets each. 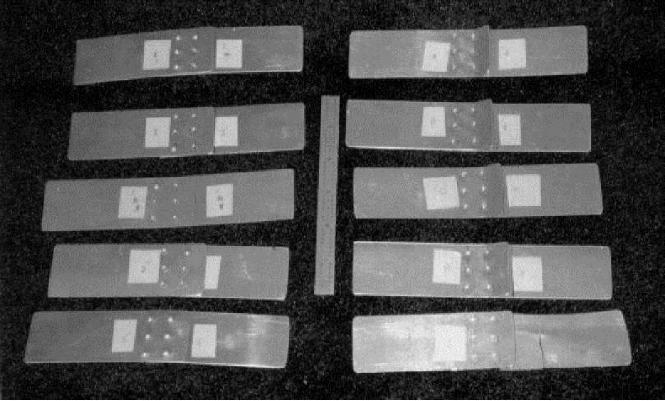 Of the 10 total coupons, five involved the use of universal head AN470AD-3 rivets and the other 5 used AN426AD-3 flush rivets. In the latter case, both pieces of aluminum were dimpled at each rivet location, as is routinely done in Van’s airplanes. 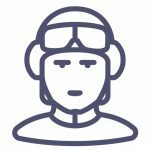 In fact, the coupon construction is similar to the double rivet line where the lower outboard wing skin overlaps the lower inboard wing skin. This joint is loaded in tension normally for positive G flight and gave me the idea to mimic it for the pull tests. Six of the test coupons, with the AN 470s on the left and the AN 426s on the right. Before getting into the results, let me ask you a question. Please think about the answer before proceeding. Just how many pounds of force do you think it would take to destroy one of the sheets used in making up the coupons? Remember this is .032, 2024-T3 sheet 4 inches long and 1.5 inches wide with no holes or rivets in it. Think about grabbing and suspending it at one end with some sort of clamp across the entire 1.5 inch width and then hanging weights on the other end from another clamp. How much weight would it take to break this .032 inch thick sheet? Would a 100-pound set of barbells do it? A 500-pound set? A 1200-pound small car? A gross-weight RV8 at 1800 pounds? A gross-weight Grumman Tiger at 2400 pounds? More than that? Come up with some sort of gut feel before proceeding. I was surprised by the answer. You may or may not be, depending on your knowledge in this area. Since some of you will cheat and read on, I’ll hold the answer for a moment! 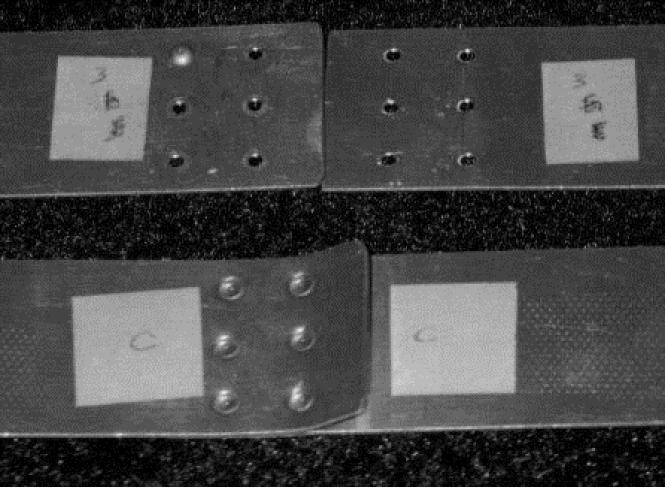 Each of the 5 test coupons, both with the universal head rivets and the flush head rivets, was riveted to a different degree. One was grossly under driven, one was slightly under driven, one was correct per the rivet gauge, one was slightly over driven and the last was grossly over driven. The slightly under driven and slightly over driven rivets were such that you would probably need a rivet gauge to detect them—I did this because I suspect that most of the rivets in our planes fall into this category. The grossly over and under driven rivets were really gross. The over driven were squashed nearly flat and the under driven were barely set at all. I did this to see just how poorly a joint made with this sort of gross error would hold up. You would easily see these and know there was a problem immediately. You’ll find the results interesting. The idea was to put each coupon in a pull test machine and expose the riveted joint to a slowly increasing force until it yielded. This was done at a structural test lab in Paramount, CA, which works mostly with civil engineering construction materials. A stress/strain graph was running and we monitored it to see the first indication of joint failure as indicated by a decrease in force required as the coupon stretched, cracked, broke in two, sheared or tipped rivets, etc. I was interested in the force required to cause the initial failure, as well as the nature and appearance of that initial failure; i.e. what actually happened first. We agreed to stop the machine at the incipient indication of failure, thus preserving the coupon in its early failure state without destroying the joint completely. I was very curious as to how things would fail and really had no idea other than the thought that the dimpled, flush riveted joint would probably be stronger than the undimpled one with the 470 universal head rivets. In contrast, one of the owners of the lab came in to watch and thought the opposite would be true. In his 50 years in the business, he had never seen this test done. What do you think would hold best? The dimpled, flush riveted construction was stronger, but not by as much as I had thought. However, and this is really important, initial failure of the dimpled construction was generally not catastrophic and occurred as rivet tipping and rivet head distortion. In contrast, initial failure of the AN470 undimpled construction was generally catastrophic by rivet shear. I am really happy Van uses the flush riveted, double dimpled joints throughout most of the airplane! Slightly under driving or slightly over driving a rivet makes an observable and thus measurable difference in the joint strength. Slightly over driving is stronger than slightly under driving and results (in my opinion) in an insignificant difference in strength as compared to properly driven rivets. In the one test of slightly over driven AN470 rivets, the joint was actually stronger than with properly driven rivets. This may have just been the luck of the draw for this single sample, so I wouldn’t put any real faith in it. A joint made of grossly over driven rivets is stronger joint than a joint make of grossly under driven ones. A grossly under driven AN470 joint is much weaker than a grossly under driven AN426 joint. No joint was as strong as the parent material itself. To summarize the summary, try for properly driven rivets but realize that minor over driving is preferable to minor under driving and results in nearly the same strength as does the condition of properly driven rivets. Shown above are the 10 coupons used in the test. On the left side are those riveted with AN470AD-3 universal head rivets and on the right are those riveted with AN426AD-3 flush rivets. In the latter case, both coupons were dimpled. A six inch ruler appears in the center to show relative size. This view of the shop head side depicts the “rivet tipping” failure mode that appeared in all of the coupons riveted with AN426 rivets. The raised edge of one coupon occurred during the test and was a typical part of the failure. This view shows the coupons with properly set rivets in their failed state. Most notable is the fact that the top coupon, riveted with universal head rivets, failed catastrophically with all six rivets sheared. Only one rivet head remained in place; the rest all popped out on failure. 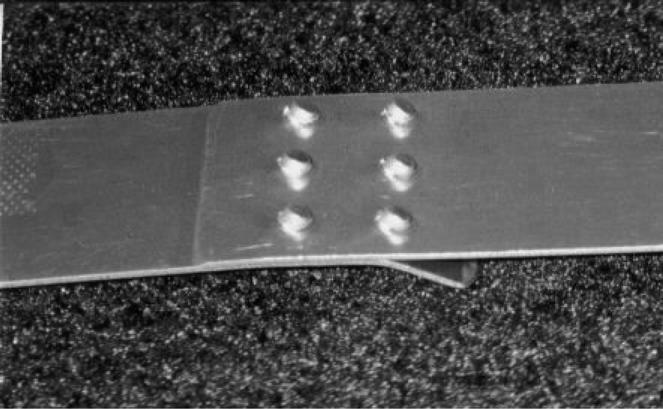 Note how little deformation exists in the rivet holes in the parent material. In contrast, the lower coupon, double dimpled and riveted with flush rivets, is still intact. It shows deformed manufactured heads on top, and the tipped rivet pattern on the bottom as shown in the prior photo. A closer view of the photo above, showing more detail of the deformation of the holes and rivet heads. As you view this, keep in mind that the failure of the top coupon with AN470 rivets occurred at 1625 pounds of force and was catastrophic with all six rivets shearing simultaneously. In contrast, failure of the lower coupon was by deformation only at a force of 2026 pounds. The interlocking, dimpled joint is 25% stronger and when it fails, does not fail catastrophically. Which would you rather have on your wing skin as you start pulling more Gs? Anyway, those are some real numbers for an area we have undoubtedly thought about at one time or another. My opinions, FWIW: I think an occasional rivet that is slightly under driven or slightly over driven is utterly no big deal and can safely be ignored. We all have some of these flying in formation in our airplanes. A line of them would be another matter. Even an occasional grossly over driven rivet is probably OK, especially if getting rid of it could cause damage. And if under-driven too much, just whack it again. Hope you learned something from this. I certainly did. Slight under 1600 5 sheared rivets! 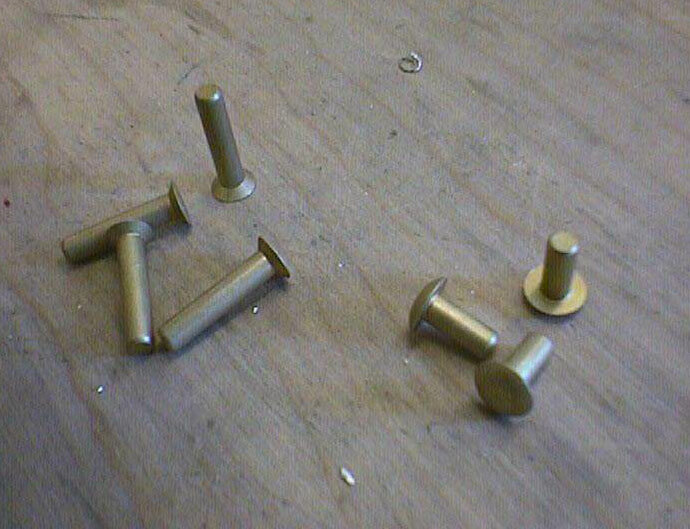 Correct 1625 6 sheared rivets! Slight over 1750 6 sheared rivets!